Oil or spray one large (or 2 small) rimmed sheet pan with non-stick spray. Whisk together marinade ingredients in a small bowl and set aside. Cut potatoes and zucchini into 1 inch pieces and put into a large bowl. Add chicken pieces to large bowl and pour marinade over potatoes, zucchini and chicken. Stir until well coated. Cover bowl and marinate chicken and vegetables in refrigerator for 1 hour or overnight. 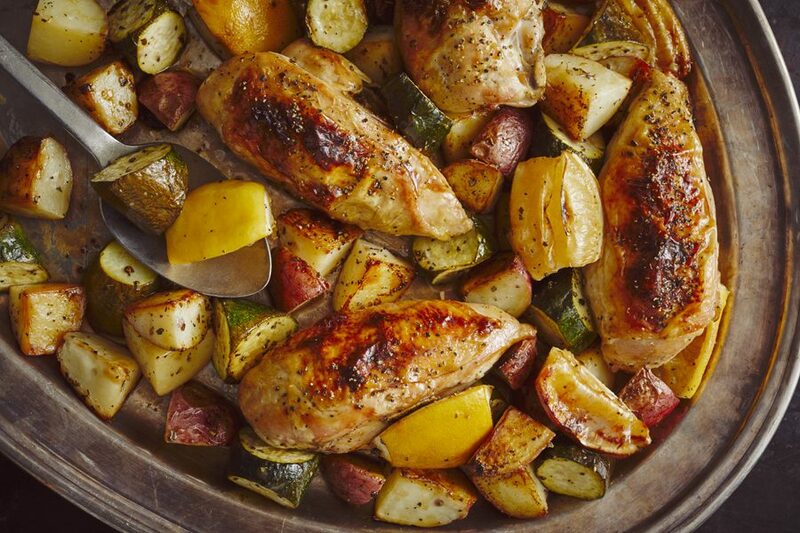 Arrange marinated chicken and vegetables in a single layer, on the sheet pan. Arrange lemon wedges all around chicken and vegetables. Remove from the oven and sprinkle chicken with lemon pepper. Return to oven and roast for an additional 5 minutes or until a thermometer inserted into the chicken reads 165F. Remove from oven and let the chicken rest for 10 minutes. Before serving squeeze the roasted lemon quarters over the chicken and vegetables. Tip: marinate vegetables and chicken overnight in a large resealable freezer bag. Place contents on a sheet pan the following day and roast for a quick week night meal.